Cognitive bias modification for attentional bias (CBM-A) attempts to alleviate anxiety by training an attentional bias away from threat. Several authors have argued that CBM-A in fact trains top-down, reactive counteraction of the tendency to orient towards threat. 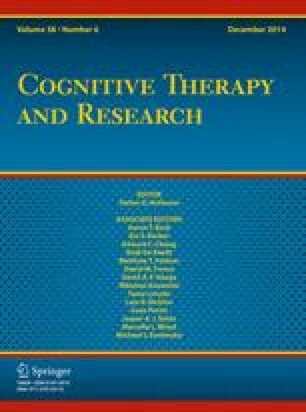 Imposing a working memory (WM) load during training should therefore limit its efficacy, since WM resources are required for goal-driven control of attention. Twenty-eight subclinical high-anxious participants completed two sessions of CBM-A or placebo training: one under a high WM load, and one under a low WM load. Attentional bias was assessed after each training. CBM-A produced an attentional bias away from threat under low load, but not under high load. These results suggest CBM-A trains top-down counteraction of orienting to threat. It also suggests the administration of CBM-A in the home environment may be affected by everyday worries and distractions. This work is supported by a BAP grant (11B101) from Işık University. We are grateful to Fulya Mücaviroğlu, Sirem Özen, Püren D. Şenyuva and S. Aslıhan Tüzün for their assistance with data collection. Robert W. Booth, Bundy Mackintosh, Sirous Mobini, Pinar Oztop, and Samantha Nunn declare that they have no conflict of interest. Booth, R. W. (2014). Uncontrolled avoidance of threat: Vigilance-avoidance, executive control, inhibition and shifting. Cognition and Emotion. doi: 10.1080/02699931.2014.882294.